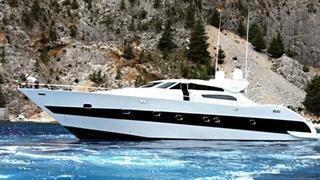 George Hapipis at A1 Yacht Trade Consortium asks me to broadcast a €250,000 price cut on the 25.2m motor yacht Lancelot. A striking Velvet 83 from the Tecnomar yard in 2006, she’s been only lightly used by her current owner and offers a quick, comfortable ride to her destination. Accommodation is for 10 guests in a master suite, VIP stateroom and two twin cabins, each with a Pullman berth while twin 2000hp MTU engines give her a cruising speed of 28 knots and a maximum speed of 37 knots. Lancelot is now down from €1.65 million to €1.4 million.